Major Nimrod Headington, Green Park Cemetery, Jay County, Indiana. 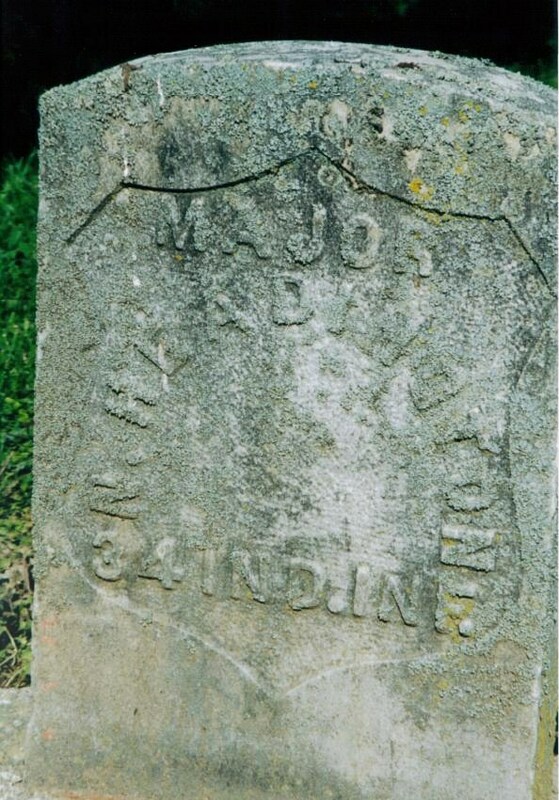 This is the tombstone of Major Nimrod Headington, located in Green Park Cemetery, Portland, Jay County, Indiana. 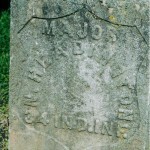 His military veteran’s marker is inscribed, Major N. Headington, 34 Ind. Inf. A large Headington monument is nearby. According to his Indiana death record he died 7 January 1913 at the age of 85 years. Nimrod was the son of Nicholas and Ruth (Phillips) Headington and is my fourth great granduncle. Nimrod Headington is another ancestor that I proved for the OGS lineage society, The Society of Civil War Families of Ohio. The requirements are that a direct ancestor or the brother of a direct ancestor served in the Civil War from Ohio or once resided in Ohio. Colonel Nimrod Headington was born in Mt. Vernon, Ohio, in 1827, and has lived in Portland, Indiana, since 1853. In September, 1861, he, with James W. Campbell, raised a company for the war of the Rebellion, which was assigned to the Thirty-fourth Indiana Infantry, and on its organization he was elected first lieutenant, and a year and a half later promoted to captain, his commission bearing date April 10, 1863. He was later commissioned major of his regiment, and January 3, 1865, lieutenant-colonel. He was mustered out February 21, 1866, his entire time of service being four years and five months. Colonel Headington participated in the battle of Baker’s Creek, or Champion Hills, where he was in command of his company, which lost seventeen men, killed and wounded, the entire division losing fifteen hundred men. Then followed the siege of Vicksburg, in which his regiment took an important part, and after the fall of Vicksburg moved on Fort Jackson, and thence to New Orleans, and participated in the Tesch campaign in Louisiana. Soon after this campaign they were sent via New Orleans to Matagorda Bay, and thence up the Rio Grande River four hundred miles to Ringgold Barracks, where their last duty was performed. Colonel Headington had many narrow escapes from rebel bullets during his long term of service, but his health became impaired, and for number of years following his discharge he was a continual sufferer from the effects of his army service. In 1870 the Colonel built the Headington House, which he conducted twelve years. He was appointed postmaster in 1878, and served seven years. The faithfulness with which he discharged his duties as postmaster is indicated by the fact that at the end of his service his accounts were examined and it was found that he was indebted to the department nine cents, for the payment of which he holds a receipt. He is now engaged in the real estate and insurance business. In 1857 and 1858 he was surveyor of Jay County. Politically the Colonel is a Republican. He was reared a Democrat, but the firing on the nation’s flag at Fort Sumter changed his politics. Biographical Memoirs of Jay County, Indiana, (Chicago: B.F. Bowen Co., Publishers, 1901), 300-1. Nice bit of headington history. Thank you! You must be a distant Headington relative?